When I visited Gem Preiz’ installation “Sapiens” in January (read here) I met Inara Pey there, who told me that Gem plans an extention of this installtion by End of February. And really, as it turns out I got an invitation for Thursday, March 15th, from Gem himself to attend the opening of this extention for Thursday, March 15th. Unfortunately I could not attend the opening but visited a few hours before the opening. The extension is called “Demiurge“. At the landing point you can grab a notecard in several language, which explains Gem’s thoughts about both installations: “Sapiens ended on the vision of the Man understanding his universe and learning to dominate it. In Demiurge, the Man becomes creative and shapes his environment, for the good or for the evil.” From the landing point you can teleport also to Sapiens. Demiurge consists of 3 parts: the past, the present and the future. Each part is built on a sim-wide space. The past reminds of of an ancient city, maybe Rome. It has classical buildings, historic buildings you can find all over the world, buildings with history, buildings that were built to last “forever”, to witness the ideas of a times. 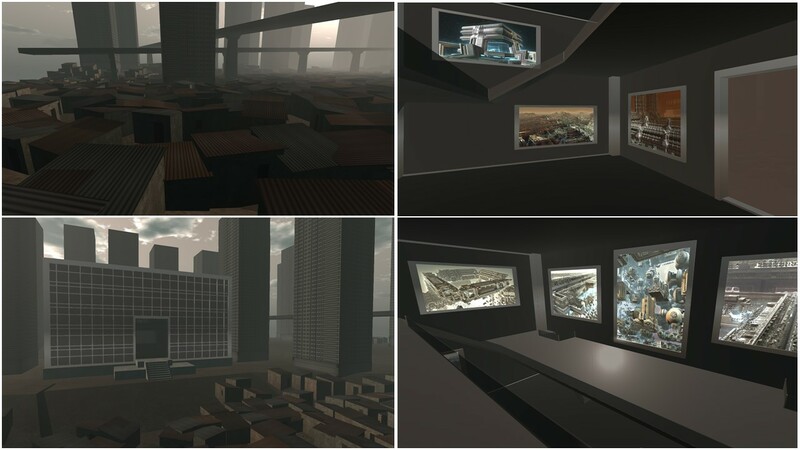 Inside of some buildings you find fractals exhibited. From the largest exhibition hall you can teleport to the next part: the present. The present is very disillusioning: uniform skyscrapers, dirt, elevated roads and thousand of tin-sheet huts. In the present of Demiurge is just one exhibition hall with fractals. It is easy to find as the buildings stands out from the rest. From there you can teleport to the next part: the future. I talked with Gem later and her told me that the skyscrapers are inspired by the chinese town Chongqing, an ocean of 25 floors buildings to house 30 millions people, while the slum is inspired by Kibera, the slum around Nairobi, Kenya. I don’t know both places, but I kind of have an idea how it might look there. The future is bright, particular with the windlight setting I used: Bristol. 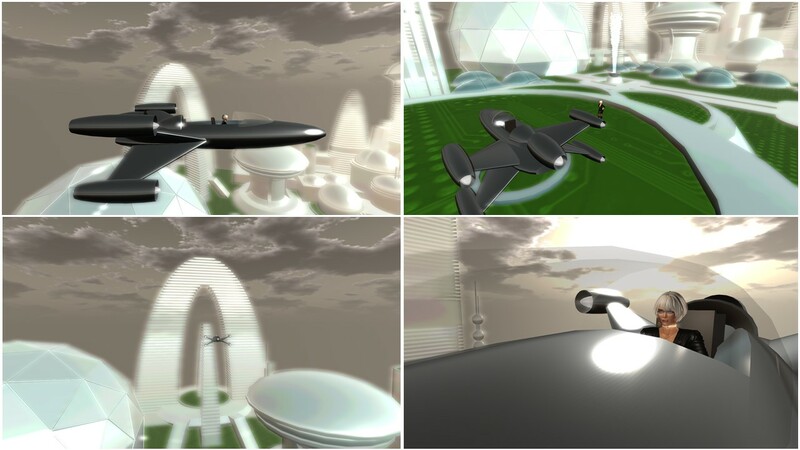 This world has futuristic skyscarpers of all forms. It’s clean and neat and organized. It does not only look futuristic but also artificial as if there’s no individuality anymore – although the buildings are creative as such, but the single human being is lost in the world. Look a bit around, you might find a starship, which you can use to explore the future from another perspective. I found it and I used it. It also adds to the fun! At the end of the installation Sapiens I saw a huge golden statue (the homo sapiens sapiens?) holding the grid cube in it’s hand, looking at it lost in thoughts. At Demiurge you’ll find this huge golden statue in a spherical building and it holds a brain in it’s hand, looking at it lost in thoughts. At the base of the statue you find teleport pads to Sapiens and to the past and the present. Demiurge is an impressive installation about architecture, not about single periods of architecture but from a higher level. It shows the clear forms and outlines of classic historic buildings that follow either function (like theatres) or simple demostrate power. There builders had he intention to create something for the eternity. It shows the uniformity of modern housing towers, the dirt and the poverty of the slums that are reality for many people around the world. 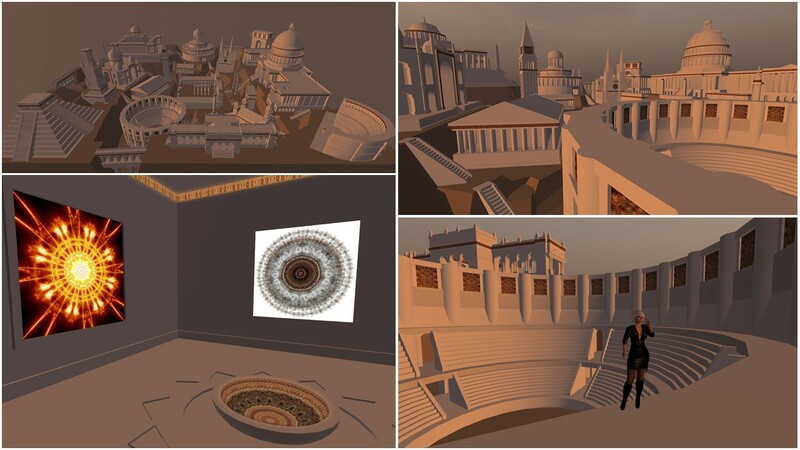 And it shows our dreams that have become reality at least partly at some metropol areas like Shanghai, New York, London ..
Of course Demiurge is also a place where Gem’s fractals are exhibited and they fit in very well as most of them look a bit like science fiction. Overall, the installation contains 32 high resolution fractals. 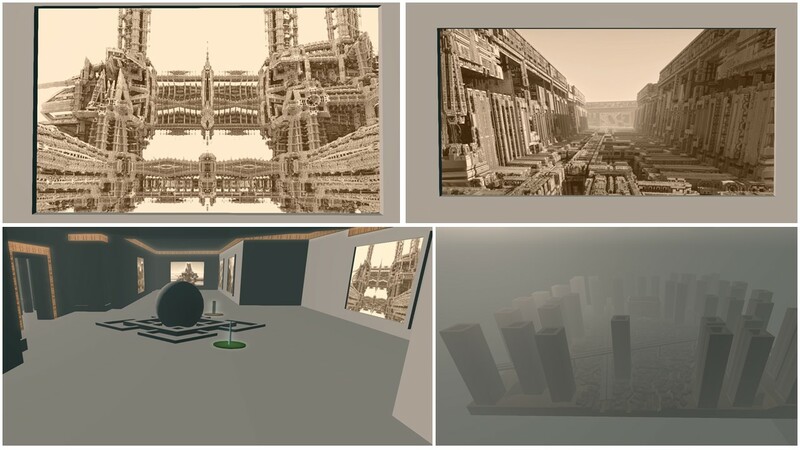 Some of them have already been displayed on Secondlife, in various other exhibitions. At the landing point of Demiurge as well as in the notecard you find recommendations about the settings of your viewer. I also recommend to turn your music on (I did). The music Gem selected fits really well. One last thing. If you have time enough, walk outside of the building where you enter Demiurge. The landing area is inside another “future” world that is dominated a one tall skycraper. Gem told me that it is inspired by a project of tower to be raised in Bassorah, Iraq, that shall raise 1.000 meter, in SL it’s “only” 340 m tall. Talking with Gem you can sense his passion for architecture, forms and skyscrapers. Thank you Gem for this extension to Sapiens. Demiurge is – at least for me – an installation you have to visit. Great work, Gem, very impressive! Sapiens and Demiurge shall be open for a visit until End of June.